The other day I got all dressed up (well not really, I did my hair and make up) and went up to my son's school to eat lunch with him. I put my daughter (age 3) into the "stay and play" at her preschool (and paid $15 for it...) so that I would be able to stay for the whole lunch period with my son. I got there early so I could catch him as he walked in the cafeteria. Immediately when I walked in the cafeteria I felt awkward being there, but was quickly put at ease when I saw how many parents were sitting at the parent tables with their children. The office had told me where he would be entering the cafeteria so I stood there and waited. I had my phone ready on the camera screen. I just KNEW he would be so excited when he walked in and saw me. Until he realized I was there to sit with him. WHICH meant that he couldn't sit with his friends. To say he was unhappy about this would be an understatement. He outright refused to sit with me! We got out of the lunch line and he sat down with his friends and said bye to me. As if I only came up to the school to catch a glimpse of him going through the lunch line. I'm not sure if what I did next was the right thing, but I was hurt and I was honestly a bit angry that my efforts to surprise my son were being rebuked so ungraciously. I made him sit with me. I bargained with him that I would stay for only half the lunch period so he had times with his friends. This made him happy long enough to snap this picture. After that though, he started to get anxious that he wouldn't have enough time to sit with his friends. "Mommy, I need to go back before my teacher gets back or else I won't get to talk to my friends. " I kept trying to talk to him, trying to engage him, trying to make him see how FUN I was and how AWESOME it was that I took time out of MY busy day to eat lunch with him. Eventually he got so anxious that he was going to miss his "friend time" that he got up and started to walk away. At this point I was near tears. I did NOT raise my child to treat me this way. At what point did I drop below friends he has known less than a MONTH in priorities? Not wanting to cause a scene, I let him go. As I walked out, I looked over at him through tear filled eyes and he smiled and waved at me. Looking perfectly content and happy that he was finally where he wanted to be. Let me tell you...I bawled the WHOLE way home. This HURT. This HURT unlike any other hurt. My son rejected me. In that moment I was MAD at him. I was angry. I was defensive. I was embarrassed. I am ashamed to say the thought of picking him up late so he could worry a bit crossed my mind. I am SO ashamed to admit that. It's true though. Because I was HURT. Hurt in only the way your child could hurt you. Thankfully, my husband talked me down a bit and I started to see the other side of things. Lunch and recess are the only times in his LONG day that he gets to socialize. I am proud that he has forged relationships with his peers that matter to him. I am thankful that he gets along well with others and that he realizes that friendships need to be nurtured too. He was never rude to me and throughout the whole course of events, I never once told him he was hurting my feelings. I expected my 5 year old son to read between the lines and to understand what I had done to be there and why he needed to appreciate it. Now don't get me wrong. I still don't necessarily approve of his behavior and we DID talk about it when I picked him up (on time) for school. He did not know he was hurting my feelings. He also expressed that he really enjoys that time with his friends and likes to eat breakfast and dinner with me. I know my child. In hindsight, I know I shouldn't have surprised him. I know he likes predictability and that he needs to know when changes are coming so he can prepare himself for them. I know he loves his friendships. Most of all, I know he loves ME. I'm sure this won't be the last time he hurts my feelings or even the worst way he hurts my feelings. We're human and we're bound to have more instances where he breaks my heart (and vice versa). I was just surprised by how it felt I guess. I've had really big hurts in my life. Hurts caused by friends and by family. Hurts that involve actual crimes against me and my loved ones. But this hurt, from my son...it ached in a place that I've never felt before. I hope it's a long time before I have to deal with it again. Have you been hurt by your children? How did you deal with it? Answer in the comments. UPDATE: I wrote this when my son was in Kindergarten. He will be entering Third Grade in a bit over a week and now begs me to come eat lunch with him on a weekly basis. My daughter does too! That was so beautifully written, Heather! I have no idea what that is like, but I think you handled it with lots of grace. 🙂 I think one day you will look back at this blog post with him and you both will love that you surprised him. How sweet! Awww, thank you Elizabeth!!!! You are sweet. 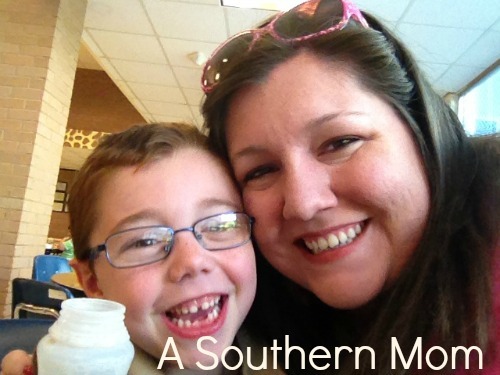 I’ve been a mom for over 5 years and I’ve never experienced anything like that! Something similar happened to me yesterday. It was family day at school where we got to spend from 8 am to 12:30 pm following our kids around in their day. She is in 4th grade and the biggest heart I know. She recieved the epacemaker award that same morning and i was so proud. Anyway, most parents didn’t come, I was one of the few that did, she immediately was embarrassed that I was there. Long story short she treated me the same way. Just made it clear that she didn’t want me there because her friends’ parents weren’t there. I left at 930 because I was about to break down crying. She has never made me feel that way and it hurt so bad. Two days ago my 18 yr old daughter really hurt my feelings. We have always been super closer. She left the house and hasn’t been back. I’m heart broken. I would take back the days of when she was 5 and hurt my feelings. The pain is enormous. Cherish your little ones. I’m so sorry Carolyn. I hope she comes back to you soon. My son is 15. I’m a single mom… raised him alone his whole life. He just recently went on a trip with a club at school for 9 days to Costa Rica. .. an expensive trip! He didn’t text or call the whole 9 days. The most he’s ever been away from home is maybe 2 Days. It really broke my heart to hear that all the other kids on the trip called home at least once. Have never felt this pain before! to start, i have 2 step children (the oldest two) and two with their daddy, my husband. I was 19 and in love, the man i had fallen in love with already had a daughter who was 1 going on 2, which i accepted. Our relationship had grown further, and just when things were going really good the man i had fallen in love with found out that his ex had just given birth to a baby boy, HIS baby boy who was named after him (this was a surprise to all of us) I was totally hurt BUT this is not where this ends…it gets better….so at the beginning i didn’t want to know this new baby i felt jealous and hurt because me and boyfriend had just talked about me giving him his first son and giving him his first name (making him a Jr) So, that all went down the drain! and explains my pain and all. well lets just say the mother of my step kids is very vindictive and spiteful. she did not know me or like the idea that her ex was with someone new. well…the first time i seen this baby boy I immediately FELL IN LOVE! i spent time with him and adored him, eventually the baby momma couldnt handle being a mother and when the baby turned 8 months she dropped off both kids to my BF and said “i cant do it anymore, you take care of them” however she did keep in touch every now and then when it was convenient for her, and me and my now husband have been raising both together since….that baby boy is now 9 years old. he knew me as mommy and called me mommy without me ever teaching him to, he did something to me that day those words came out. His BIO mother hated that, and did everything in her power to try to change that, she had no respect for him or anyone for that matter, on her time when she would have them over, she would scratch him, pinch him wither her nails leaving him scarred and swing him around when he wouldnt listen, she was just evil- on that note, i have had many altercations with her due to her craziness and hate towards me, she had assaulted me 3 times infront of her kids leaving me backed up in the corner (i refuse to let the kids see me do anything to their real mother) but only when my back was turned , she could never face me or do anything when i gave her chance,so this will help understand this story a bit better. Til this day my baby boy who i consider MINE has loved me as his mother and would rather spend time with me on mother’s day than his bio mom (makes me feel WONDERFUL) and yes she still treats him bad, and treats her daughter like a princess, he now has no RESPECT for her. So the kids come back home time to time telling me that she is always down talking me calling me bad names and they know and understand the kind of person she is and the things she is capable of they have seen her hit and scratch her boyfriends they know she put her last boyfriend in jail and they dont trust her or even see her as a mother, she is more like a older sister or a young immature Aunt to them, well… with all the being said knowing the past and all that ..last night i just found out that my baby boy has been calling my dumb to his bio mom. he says that when i tell him “do you think i am dumb?” he answers in his head “yes” . this info i just heard last night has torn me to pieces, PIECES!!!! at first i didn’t think too much about it and was like , ah he is just a kid, we have all said or thought those things about our own parents before….BUT then i thought about it more while laying in bed, and it hit me! like i got punched in the stomach out of no where. my son that has been through so much who has shown me the best in him and who cares for me when im down has just told the one person who tries to hurt our family and my one and only real enemy that i am dumb 🙁 i dont get it! he is always saying wow, mommy you are good at this and wow mommy how did you do that, man mommy you were right, mommy i love you, dang mommy you know a lot! and last but not least…how did you know mommy! i feel so betrayed right now, it is true that when your child hurts you, that it hurts worse than anything it seems and hurts in a place you’ve never hurt before. he has sided with her,he has sided with my enemy! not sure if it was to get on her good side or not, but he disrespected me to the fullest by sharing that with her. and it gives her so much pleasure to let us know! Aw I’m so sorry 🙁 . I guarantee he doesn’t think you are dumb. He just has other voices in his head telling him untruths about you and probably promising him things that can’t and won’t be delivered. Just keep loving him and being his mama and lavish him with your love even when he’s hurt you. He’ll be able to see the difference between the two moms in his life as he grows older. I’m so sorry. I wish I could give you a big hug! Elisha ~ Sometimes we are so emotionally involved in a situation, there is simply no way to take a step back and see things for what they really are. Should you have been hurt that this child you love and have treated as your own, talked behind your back? Yes, that is completely understandable and I can only imagine the hurt & betrayal you felt. But as an adult you have got to step back and look at this for what it was. It wasn’t about you. He is caught in the worst possible love tug of war possible ~ and he is a child. He wants LOVE ~ even her underhanded love, because she is his mom in the end ~ even if you are a better mom than she is. He is going to tell her what she wants to hear. Don’t you see that he is telling you all the wonderful things too? He wants you both to be happy. Both to love him. He doesn’t care that she is unworthy. 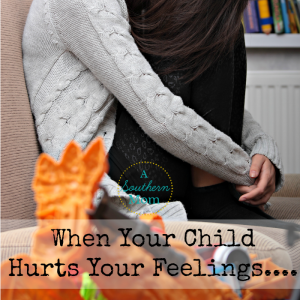 You mentioned that you were ready to blow it off realizing that he was just a kid, but then a wash of rage came back because you felt humiliated that she was gloating. It’s not really his silly words that hurt so much, it’s what she thinks of you. You have given her power over you. ~ she has so much that she can control you even when she’s not there. Don’t let that happen ~ don’t give her the satisfaction. You are strong and so much better than that. You will need to be the bigger person ~ always. He needs you to be his rock, no matter what his childish mind rationalizes. God Bless and please know I say all this in love for a fellow mom. You can do this girl. “We raised them to have an opinion and share it. To tell us if something was bothering them. We just never expected it to be us that was bothering them.” Exactly! Thank you for your wise words! I’m sending my girlie off to Kindergarten this Tuesday and I’m aching already after almost 6 years at home with her. She has been acting out a bit (I think in response to some anxiety about starting school … even though I know her little personality will LOVE it) and I just have to keep reminding myself that even though she’s being hurtful at times, she doesn’t mean it the way I often take it. She is the same as your son and likes routine and knowing what to expect… so the unknowns ahead are freaking that girl out a bit (and mommy too, to be honest). Thanks for being honest and sharing your heart and your hurt. I’m thankful for a husband that talks me out from that other side too. 🙂 I know this is only the beginning of a lot of new chapters! I want to thank you so much from the bottom of my heart….you are exactly right! I had to vent somewhere and your words…well you gave it to me just like I needed to hear it and I will definitely have to be more open and understanding…and believe me I try so hard for him because I know at the end of the day he is only crying out for her love. Dear Heather, today my youngest adult daughter celebrates birthday. Coincidently her first name is the same as yours, but she has been called by her second name. I live in another country,, I’m not a native speaker, so I hope you will excuse my English. Anyway, ever since her puberty I fail to connect with her. I should explain something, she has been diagnozed with autism and therefor it’s more complicated. She left home about a while ago, because she wanted to be more indipended, I considered that very normal, she needs to spread her wings. But it’s hard to keep in touch with her, even with her elder sister, we always are the ones that send her messages etc. If I wouldn’t send her a message or call her, I wouldn’t hear from her at all. It hurts, at the same time I know she can’t help it. We are taken for granted, she knows she can rely on us, she knows we won’t let her down. But the interest is not mutual. Writing this with tears in my eyes. I called her this morning to congratulate her and asking whether she has plans, she doesn’t know, she is busy, she has a boyfriend with the same disorder, she is going out to dinner with him. That’s okay, but she knows yet whether or when she will have time to celebrate with me or her sister. My other daughter is hurt too by this, I know. I try to keep it in perspective, knowing it is not unwillingness but inability. I can’t really share it with my husband, he is not her father and as much as he tries, he cannot really feel what I feel, he tries to rationalize things, but that doesn’t comfort me. I think she doesn’t even realize the pain I’m suffering. It’s good to share it here. Thank you for reading my story. I’m so sorry 🙁 . I don’t check comments on this blog often enough and I feel awful I did not see your comment until now. I am sure that hurts so much. I wonder if there is a way that you can express to your daughter that it hurts you when she brushes you off. Maybe she doesn’t realize the depth of the hurt? I would lean on your husband though. Even though he is not her father, he is your support and I think you should expect him to be there for you when you hurt. a single mom of a 14 year old, who does not want to spend anytime at home unless it is for food and a place to sleep at night. It hurts after everything I have gone through to make sure my child has the best I can give. I feel alone. This is the pain I feel of never being wanted. It has destroyed me.